The rotated airfoil-shaped wing mast makes a smooth transition from mast to sail on the leeward side. This provides cleaner airflow around the mast. The benefit is better attached airflow, thus less drag and more power driving the boat. A standard aluminum, oval mast provides improved performance when rotated. But supporting an aluminum mast when rotated becomes complex. 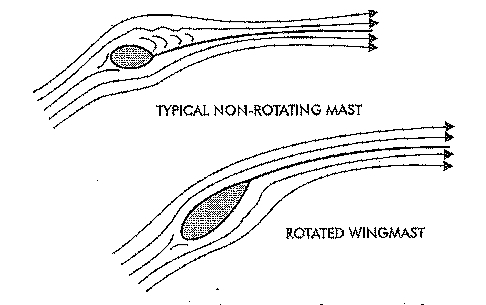 The wing mast solves this problem with its greater dimension in the fore/aft and lateral planes of its cross section. This can be used to produce a spar that has better column load capability than one of smaller dimensions. In other words, the wing mast structure can take greater compressive loads without buckling. It therefore requires fewer support wires, spreaders, etc. This advantage allows the rotating spar to be fully exploited with few trade-offs. The wing mast is very attractive from a performance perspective. We have built wing masts for a variety of multihull craft using a variety of building techniques. Our most successful design, the 050, has been used for racing and cruising boats for over a dozen years.